Journal, In Progress is the accumulation of a Polaroid self-portrait made everyday from January 1994 through January 2009. Together the unassuming and approachable images present a narrative time line measuring growth, change and regression. Individually, they address issues of the body and identity in a direct and non-glamorous way. 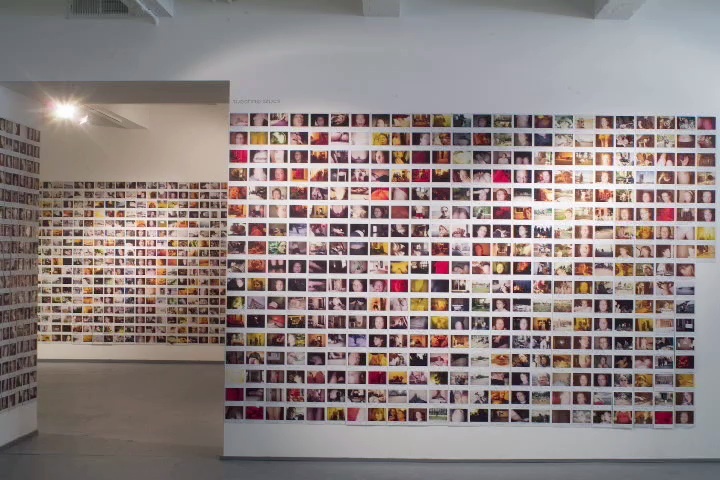 The 4” x 4” Polaroids are arranged chronologically in vertical strips of 17 equaling the subject’s height of 5’6”. This allows the project to turn corners and wind around walls. Traveling across the wall it grows an average of 7 feet a year. After 15 years it is comprised of approximately 5500 photographs and over 110 feet long. Together the images depict universal experience; their raw, personal and sometimes frivolous nature demythologizes the self with humor and vulnerability. The images document yet remain elusive. Viewed close up, they suggest individual transformations, recording momentary changes. Seen from a distance, the figures evaporate, the ritual becomes more apparent and the measurement of time emerges as the images fade and change, an imperfect memorial to the everyday. Journal has been shown in its entirety and in segments. Because of its flexibility, it can fit into almost any space. Smaller portfolios are drawn from the entire project including the Volatile Bodies portfolio and exhibition – an edit of images dealing specifically with body issues, printed as 7” x 7” inkjets and Moosebook, a publication of images taken at Black River Crossing. In 2010, the entire project was made into a movie, 15 years in 15 minutes. Installation images from it's 10 year exhibition at Flatfile Gallery in Chicago can be linked to below.